A balanced yogic body begins with well executed movements performed with great ease and care. But what is “balanced”? Many yoga instructors are unaware of normal range and function of critical junctures of the body, most particularly the pelvis. In the practice of yoga, every asana (posture) has its root in the pelvic girdle. Any misalignment of the pelvis creates an imbalance, and a repeated misalignment elevates the risk for injury. 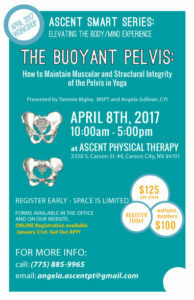 The purpose of this workshop is to highlight what represents normal mechanics of the pelvis and its application to a yoga practice. How to truly practice ahimsa (non-harming) and injury proof your student’s practice. Understanding the basic biomechanics and anatomy of the pelvis and surrounding region. Recognizing the symptoms of sacroiliac joint dysfunction. Practical application of sound biomechanics in asana to prevent pelvic girdle injuries. Call to schedule your free trial. Get Well. Stay Well. Live Well. The Personal Wellness & Injury Prevention Program at Ascent is designed to fit your individual needs. offers challenging, fun, and memorable trail running experiences. Get some serious DIRT&VERT this summer with this FUN and CHALLENGING Series. You can choose your Physical Therapist and you don't need a referral. If you are having surgery, there is often a very small window of opportunity for optimal recovery. Not all providers are the same. Experience the Ascent Physical Therapy DIFFERENCE. Call Ascent today and schedule your Free 30-Minute Consultation. Copyright © 2019 Ascent Physical Therapy. Powered by WordPress. Theme: Spacious by ThemeGrill.